Easter candy has GOT to be the best candy season of the year, am I right? 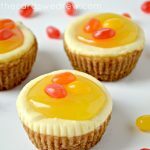 I love the jelly beans, Cadbury Cream Eggs, Robins Eggs, Mini Cadbury Eggs, the mini sweettarts…the Peanut Butter Reese’s eggs…I mean, it’s my favorite time of the year. 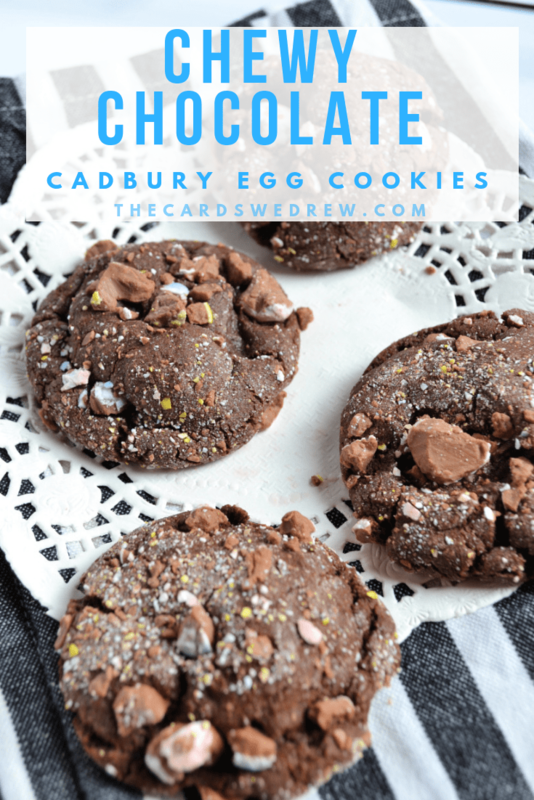 Today I thought I’d combine my love of Cadbury Eggs with my love of Chewy Chocolate Cookies and create a little Easter Cookie baby with these delicious Chewy Chocolate Cadbury Egg Cookies. 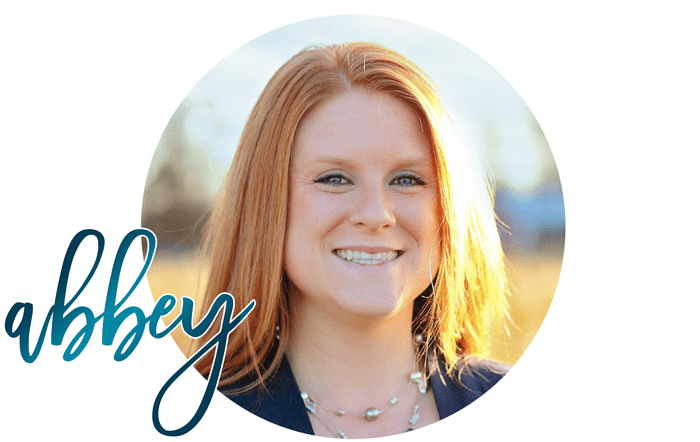 When I first shared my Chewy Chocolate Cookies you guys went crazy and it started getting tons of comments and traction…they truly are the easiest chocolate cookies to make and they have the best flavor and texture! 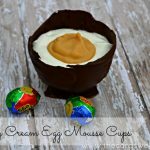 They are crisp on the outside, with a chocolaty, chewy inside…and when rolled in Cadbury Eggs…they’re like a little piece of Easter Cookie heaven! 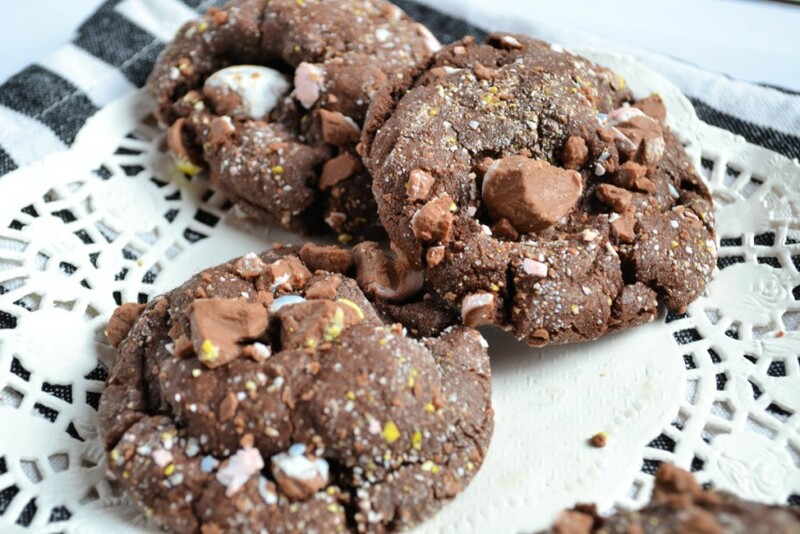 They make a ton of cookies and the little flecks of Cadbury eggs on them make them super pretty, as well as tasty. I originally tried chopping up my cadbury eggs in my food processor, but it just started to turn them into dust, so I switched over to using a meat mallet to gently break them into chunks. Depending on the quality of your food processor (mine is tiny and rarely used), you still make be able to make the little pieces that way, just try a few first. 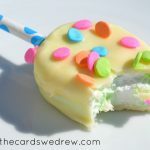 I’m totally making another batch of these because they are definitely the perfect Easter Sunday cookie recipe! 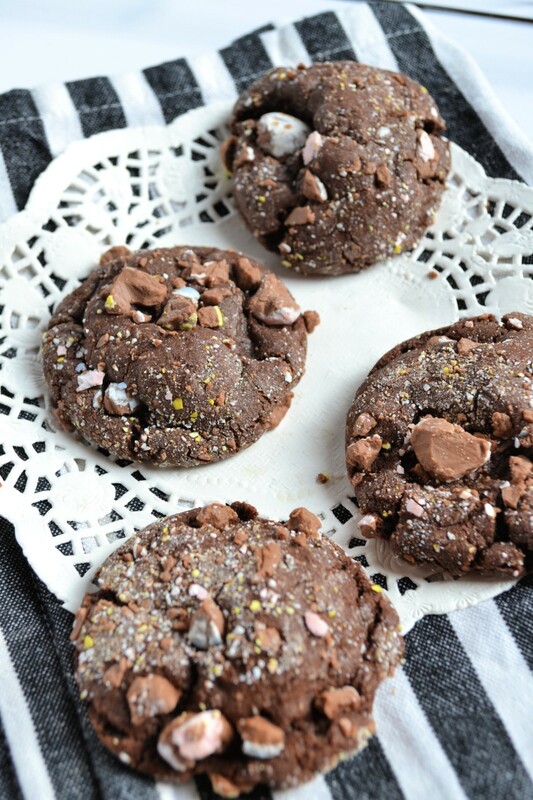 Cadbury Egg Cookies have never been easier than these and prettier either! 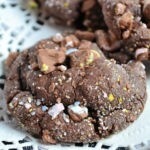 Delicious, chewy, chocolaty Easter cookies that everyone will love! 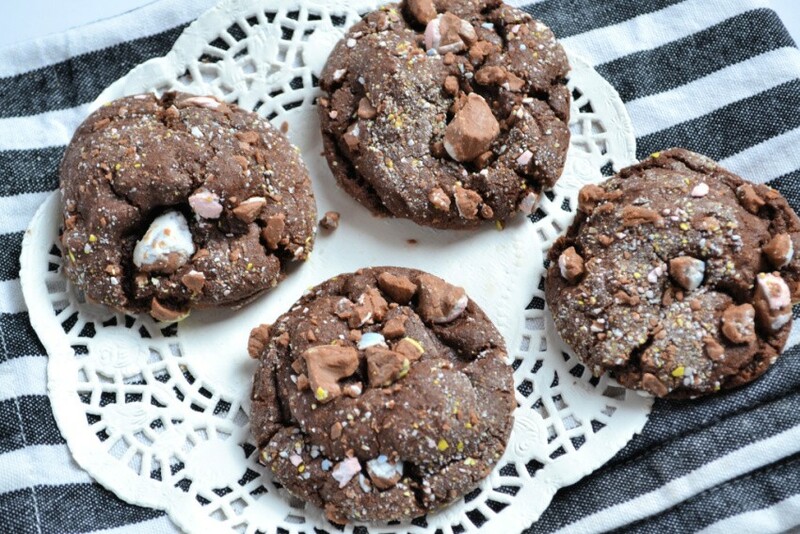 These Chewy Chocolate Cadbury Egg Cookies are SO simple to make with the BEST texture--a crisp outside and a soft, chewy inside. 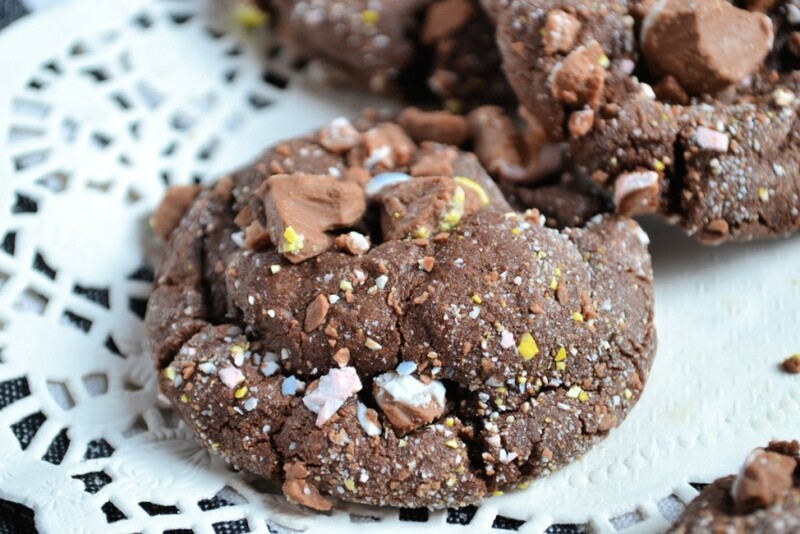 Everyone that tries these cookies immediately wants the recipe!! Cream butter and 2 cups of sugar in a large mixing bowl (leave remaining 1/4 cup of sugar to roll dough in). Add eggs and vanilla and blend well. 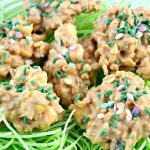 Using a spoon or cookie scoop, roll dough into balls, then roll in the 1/2 cup crushed Cadbury eggs. Then drop mixture onto uncreased cookie sheet.